Kyle Neill celebrates during his previous spell with Portadown. Kyle Neill considers this week's return to Portadown a second chance at playing for his football first love. 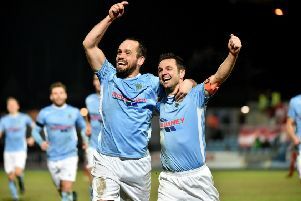 The 39-year-old left-back has signed a deal to bring him back to his hometown club and Neill is relishing the opportunity to help steer the Ports back from the blow of top-flight relegation. Neill won the game's major prizes in his original spell at Shamrock Park but must now play a part in helping to rebuild a club reeling from years of frustration on the pitch and financial issues off the field. However, despite the recent turmoil, Neill admits the chance to sign with Portadown was always going to prove the perfect finale to a glittering Irish League career. "I had offers and it was nice to be wanted but once Portadown came in for me I could never turn down that opportunity," said Neill. "They say never go back but it's my hometown club and I just want to do what I can to help get Portadown into the Premiership. "It was disappointing the way things ended for me first time around at the Ports, although I went on and made a name for myself and won medals with Glentoran and Glenavon. "The chance to come back and finish it off in the right way means a lot and I just cannot wait to put on that Portadown shirt again in a game. "As a kid me and my friends used to have competitions in class to see who could draw the best Ports kit. "When I was there first time around we had the new badge on, which I never liked, so it's great to know I will be running out now in a Ports kit with the old badge back. "We used to go watch Portadown as kids and every week seemed like a cup semi-final or final and I remember chasing the bus up the town after winning our first league title. "I've made some great friends and have brilliant memories from my other clubs but this is a chance to give something back to Portadown." Neill's return, around a decade on from his last Portadown appearance, has been motivated by much more than simple nostalgia. "I don't want to be a bit-part player and feel I can play regularly and help with my experience as well as my passion for the club," said Neill. "It has been tough to watch the club in such a mess and the Premiership benefits from having Portadown in it for gates as much as anything. "The club is moving in the right direction and increased communication with fans is a big boost for the future. "It is also going to be great playing under Niall Currie as my manager, with Jay Willis the assistant and both Trevor Williamson and John Convery on the coaching team. "I played in the same teams as John first time around and he was outstanding. "Growing up in Annaghmore Boys' Brigade I looked up to Niall, Jay and Trevor. "It's all just a dream come true."